All during the war there have been very few visible signs of it here in Hartford. Occasionally, on the street, one would see a long string of young men on the way to the draft board, but that was all. We were intent on the war, yet it was far away. At first, when someone that we had known was lost, there was an extraordinary shock; later, this became something in the ordinary course of events, terrifying but inevitable. At the moment we are passing through a period of readjustment…From our point of view here at home, America has never been on the make, or on the grab, whatever people may have said of us elsewhere. The Japanese war is likely to change all that. This morning one of the people on the radio was talking about the necessity for having fortified outpost throughout the Orient. I think most people would accept that idea quite naturally, and be willing to fight for it. The Cummington Press…is going to print a small book for me during the next few months. When it is published, I shall be glad to send you a copy. Stevens wishes to send this book to Guthrie as soon as it is published. When they were planning this new book they wanted to use color to some extent. Accordingly, I sent them one of your books since green and blue were among the colors that they were considering. Fortunately (I think) they concluded to do the text in black with initials and drawings in color. 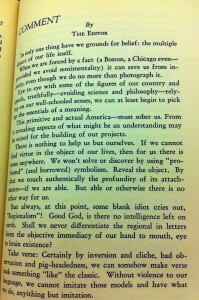 This use of color Stevens mentions shows his desire for his poetry to be something contemporary and fashionable. It is at this point where the relationship between Guthrie and Stevens becomes clear; Stevens values Guthrie’s work as a printer and his utilization of color in his publications; something he wishes to emulate. Stevens evidently wants Guthrie’s artistic opinion of the book. More than ever there is a feeling that anything not a part of politics, not a part of sociology and not in a general way a phase of mass thinking has any right to exist. What is going on in the world now is an extraordinary manipulation of the masses. The manipulating forces are not apparent. It can hardly be said that the politicians are manipulating forces because, as the great strikes demonstrate, the forces behind the strikes are defiant of the politicians. The mechanism for this sort of thing has been perfected beyond belief…We have never exploited workers as they have been exploited elsewhere; it is still true I think that the man at the very bottom feels that there is a chance for him to be the man at the top. Although the beginning portion of this message seems altruistic in that he upholds the importance of freethinking, the concluding sentences reveal his political opinions. 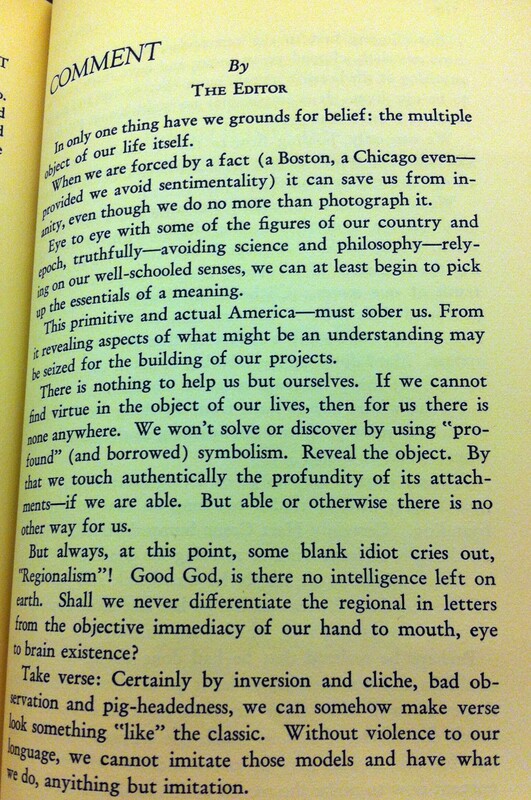 This paragraph, written by Stevens himself, provides a portal into the very mind of this poet and insurance executive. From the passage above, what attitude does Stevens hold toward the lower class? Clearly he sees the lower class as exploited, yet it is obvious that he does not see this exploitation as bad. In fact, he himself does not believe that there is a chance for the man at the very bottom to be at the very top, he just believes a man at the very bottom feels that there is a chance for him at the very top. Perhaps Stevens believes that the poor will always think there is a chance for success, even if success is only a hope. How does this dark ideology appear coming from an insurance vice-president? Written in confidence to his close friend, this letter and the messages contained in it reveal a lot about his political opinions and his feelings toward the portrayal of his work in his about-to-be published book. These letters, however, are just two in a series of around seven where both the realities of war in England and The United States are evident. Certainly Stevens valued his dear friends opinion on the artistic appearance of his newly published book, while also hoping to receive some original artwork from Guthrie. It is also possible, however, that these letters reveal a lesser-known side of Stevens; Stevens as an insurance executive. 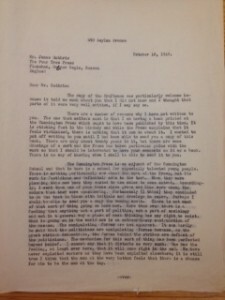 Nonetheless, these letters are a classic example of documents preserved by the Watkinson Library in which a wealth of knowledge can be extracted to provide a richer understanding of modern poetry; specifically, the man behind the poems of, Hartford’s own, Wallace Stevens. 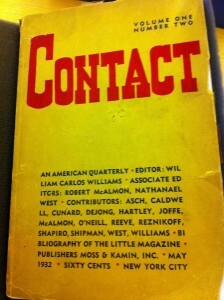 When I searched the Watkinson for an object related to William Carlos Williams’ poetry, I found myself interested in a 1932 edition of Contact, a literary journal first published in December of 1920; three more editions came out in 1921, and a fifth and final edition was published in 1923. 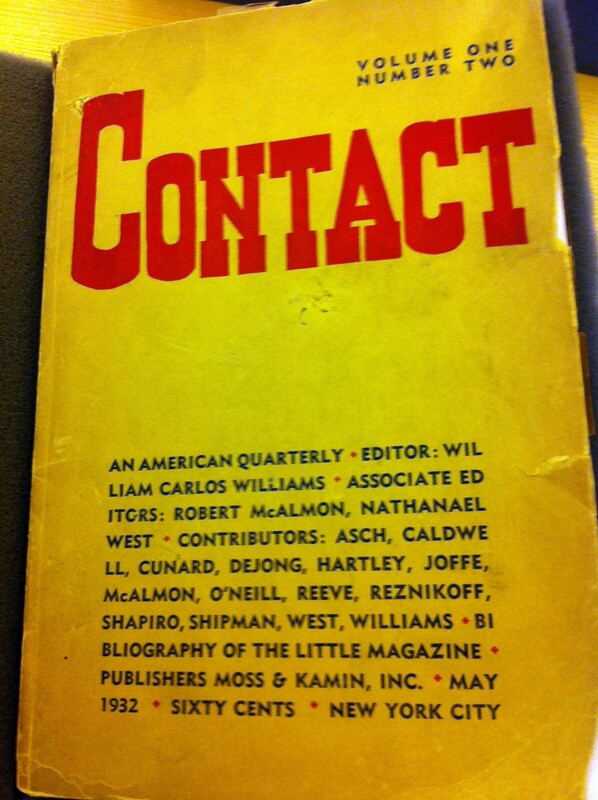 In 1932, Williams, this time working with Nathaniel West, revived Contact, renaming it Contact: an American Quarterly Review. However, the revived journal only lasted for a total of three volumes—all of which were published in 1932. The copy I examined at the Watkinson was the second volume of this journal. Part of what initially caught my attention was the quality of the paper. While it was old, certainly, I was more interested in the fact that the paper was not of good quality. 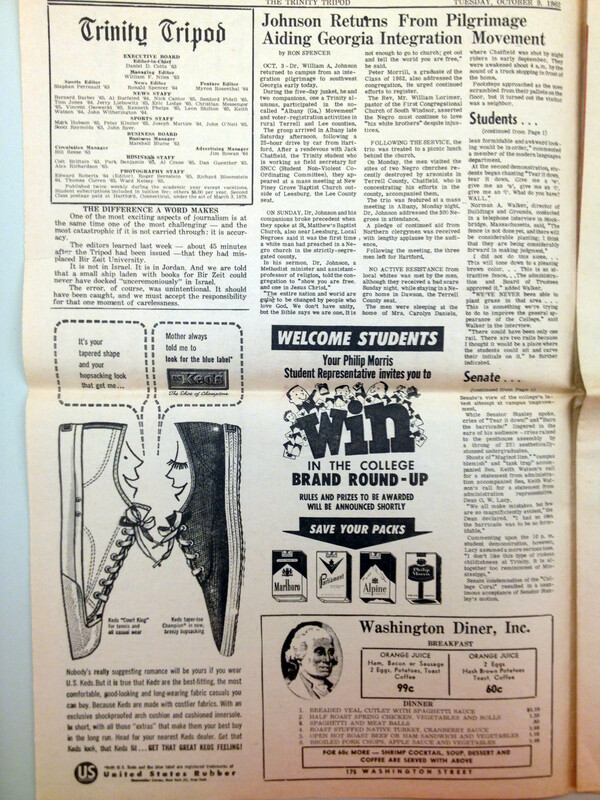 The cover of the journal is unassuming, with no frills; however, the font is large and red, which commands attention. 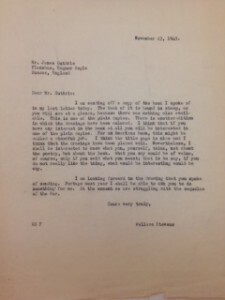 There were very few advertisements in the journal, and with a little investigating, I discovered (in correspondence between Williams and Ezra Pound) that Williams had no money with which to pay for submissions to the journal. It appears that neither the venture in the 1920s, nor this 1932 venture, was particularly successful financially. The volume I examined of Contact includes two poems by Williams: “The Canada Lily” (later renamed “The Red Lily”) and “The Cod Head.” I believe that this was a first publication for both of the poems. Certainly, Contact served as an opportunity for Williams to showcase some of his own poetry. I also discovered, looking through this particular volume, that the journal also contained a continuation of a bibliography of “Little Magazines,” compiled by David Moss. This appears to be one of the first times that such a bibliography was compiled. Each of the three 1932 volumes presented a section of the bibliography, as it was too long to include in one volume. The commentary also gave me what I suppose I might call an insight in Williams as a person. 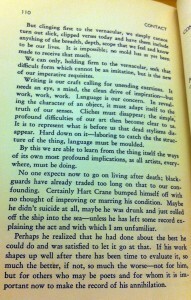 Toward the end of that piece, he writes about Hart Crane’s suicide. While I was initially struck by what felt like callousness, when Williams writes that “no one expects now to go on living after death; blackguards have already traded too long on that to our confounding. Certainly Hart Crane bumped himself off with no thought of improving or marring his condition.” I may have been startled by the “bumped himself off” when I would, perhaps, have anticipated some sympathy for a troubled man. 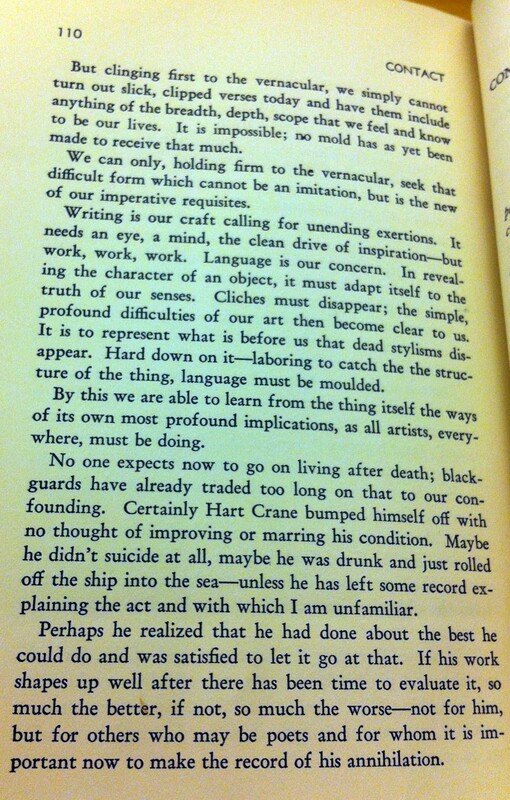 Instead, I began to see Williams’ point that perhaps Crane had “done about the best he could do and was satisfied to let it go at that.” There is a practical quality to the statement that is, I suppose, satisfying. 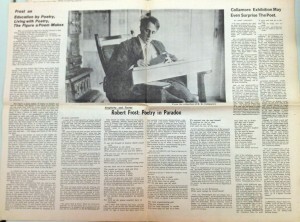 Robert Frost was the focus of my quest at the Watkinson as part of Professor Rosen’s Modern Poetry course. The task was a seemingly easy one (considering the sheer volume of manuscripts the library has to offer from Frost) but it was complicated by the mission to find something truly unique to the poet and the library. I ventured through the Watkinson’s large glass doors with an agenda to focus specifically on Series V of the Watkinson’s collection on Frost: the poet’s collection of Christmas Cards. The cards ranged from the years 1934-1962 and were housed in a total of five precious archived boxes. My afternoon began and ended with just two of those boxes ranging from the years 1934-50. What initially struck me, when I began my research through the cards, was that they were not cards at all like we receive today in the mail, covered in glitter with snow-covered sleigh and deer, but rather they were small booklets. Booklets that were printed on thick paper, bound or sewn with a thin yarn, no larger than maybe six inches across, and often in earthy tones of brown and blue rather than the green and reds we envision for Christmas today. As I began to delve deeper into the collection I began to realize that the holiday booklets often had nothing to do with the Christmas season but were rather compiled based on what the next poem Frost was to release for publication. For example the 1946 card featured the Frost poem A Young Birch and the booklet’s title page introduced ‘a new poem by Robert Frost.’ Each consecutive year seemed to feature that year’s new and exciting poem by the poet. This fact was interesting to me because it cemented the ideas from Professor Rosen’s course, that Frost was a poet that wanted to be popular. And this Christmas tradition helped Frost achieve certain popularity among the recipients of the cards. Though Frost was not fond of poet Ezra Pound, you can clearly see a certain selectivity or exclusivity, similar to Pound’s, which existed at the start of this tradition. 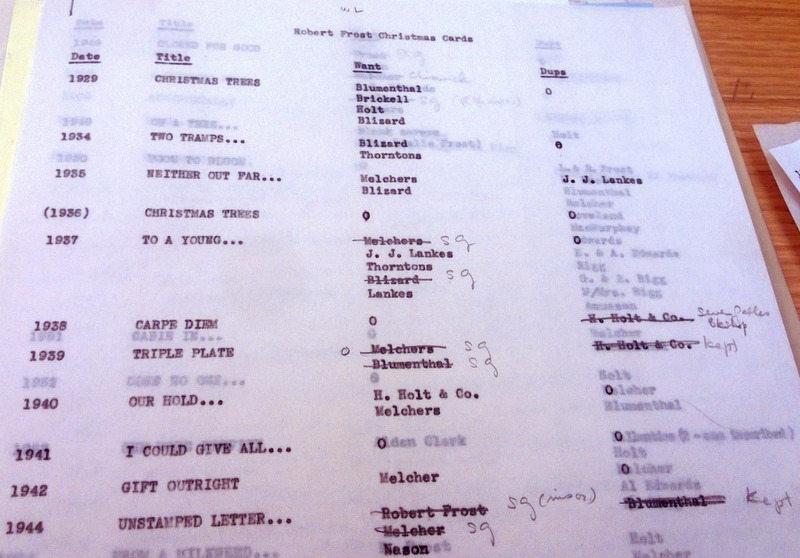 After my visit at the Watkinson I did some additional research on poets.org about Frost Christmas Cards and discovered that the first batch of Christmas booklets, Christmas Trees was only sent to about 250 people, but by 1963 when the last booklet was mailed, nearly 20,000 copies were received. This proves to me that Frost wanted the popularity and eventually expanded his exclusivity over the years as he realized how deeply people enjoyed these booklets and that they got his name out to his adoring public. Each booklet that I leafed through was printed by the Spiral Press in New York City which was run by publisher and friend of Frost, Joseph Blumenthal. Blumenthal is the man who, according to the poets.org article, took the liberty to start the Christmas card tradition with Christmas Tree. Blumenthal had printed copies of the poem for himself to send out to friends and family that first year. Many of the other names that would show up in the records of the cards in the Watkinson lists also ended up being publishers and close friends of Frost. Henry Holt and Frederic Melcher are just a couple examples of the families that took part in sending the cards out into the world. There were many booklets to leaf through and clearly many people have received these over the years, but the one object that most caught my eye and which I chose to present in class was 1940’s Our Hold on the Planet. This object seemed extra special because it was not just the card that was sent out that year but what the Watkinson had was a proof of what the card looked like as it was being developed. The proof, which included pencil markings and drawings by (I assume from the descriptions on the envelope) Frederic Melcher, shows how the family wanted the card to be presented on their behalf. “Holiday Greetings” is crossed out and “Christmas Greetings” is penciled in as well as a small holly leaf that ends the booklet. The object shows the time and detail that went into to personalizing the poem based on the family or company that planned on sending the card out that year. The finished copy of the booklet that the Watkinson had enclosed with the proof is the card that was sent from Frost to friend and collector Charles Green (CRG). Frost’s own handwriting can clearly be seen on the title page of the card and I discovered through research and a conversation with Watkinson archivist Peter Knapp, that Green and a local insurance agent and friend of Frost named H. Bacon Collamore were instrumental in donating their collections of Frost works to Trinity College. I found out that Green was not only a friend and collector of Frost he was also the first director of Jones Library at Amherst College where Frost taught and which houses one of the largest Frost collections. It is no surprise that Green is one of the gentlemen who donated much of his collection to Trinity, including his own personal Christmas card from Frost. 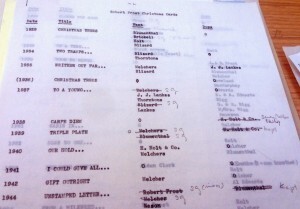 The other data that the Watkinson had complied was how many of each card had been printed and who requested the copies. Our Hold on the Planet was printed in 600 copies for Henry Holt, 250 for Robert Frost and 125 for the Melcher family. Both cards as well as the data found were definitely unique to the Watkinson. I don’t think very many people or establishments could say that they have a proof of a Robert Frost Christmas card from a family and publisher that sent out his poems yearly. I think Trinity is extremely lucky to have the Watkinson and I feel lucky to have gotten the chance to spend a couple hours there sifting through Frost and confirming my ideas on the poet, that he was a man who loved to share his poetry and to gain popularity in the process. At the beginning of the semester, each member of my Modern Poetry class was asked to select a poet who we would later research in the Watkinson. There were about a dozen options on the list, including but not limited to Pound, Yeats, Williams and H.D. Despite the extensive number of options I had to choose from, the only poet I felt comfortable selecting without doing any background research was Robert Frost. My lack of knowledge of modern poets turned out to be extremely beneficial, though, and in choosing someone so obvious, it also happened that I picked someone whose work the Watkinson seems to have been collecting in droves for decades. That said, finding something interesting about Frost was the furthest thing from difficult. In fact, it was actually harder to narrow down what I could look into from the sheer amount of manuscripts, newspapers and the like that the Watkinson has to offer. After combing through the immense Frost archives, I decided on one of the less conspicuously impressive things they had to offer: Volume LXI No. 6 Trinity College’s The Trinity Tripod from Tuesday, October 9th 1962. 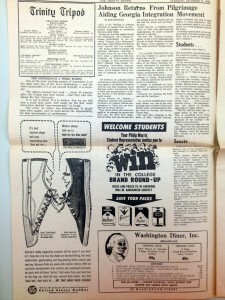 At first glance, the newspaper appeared much like any other one might see today—with a short section on a professor returning to campus, ads for Keds sneakers, and a chance to win something through a student representative’s event. However, when I flipped to the second page of the paper, I was shocked at what I saw. 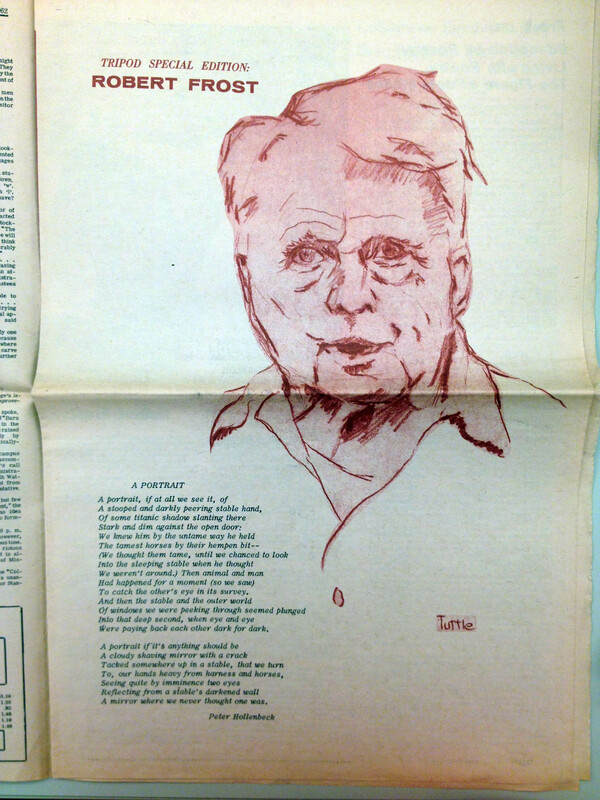 In red ink and covering the majority of the page was a drawn portrait of Robert Frost with the heading, “Tripod Special Edition: Robert Frost.” To the left of the drawing, a poem entitled, “A Portrait,” by Peter Hollenbeck. This is what kept me reading the rest of the newspaper, and what eventually lead me to read the entire article of, “Robert Frost: Poetry and Paradox,” which appears as a double page spread in the section that follows. 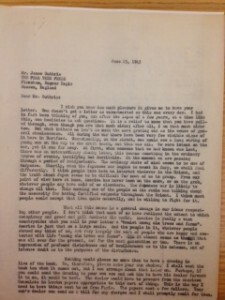 When I first picked this piece to write about, I thought maybe it wasn’t impressive enough—after all, with everything the Watkinson has to offer on Frost, one’s first inclination is likely to choose something along the lines of a first edition signed manuscript rather than a Trinity newspaper that is still in print at the college today. This simple fact, though, that I read this newspaper in my spare time at school, made this special “Frost” edition that much more intriguing. The edition’s main article is a series of quotes by Frost himself (who I found, after speaking with one of the very helpful Watkinson employees, had actually come to Trinity just prior to this being printed.) In the newspaper, Frost speaks on “Education by Poetry, Living with Poetry, The Figure a Poem Makes.” This topic in and of itself is something I cannot imagine ever seeing in a Trinity Tripod newspaper today. More than anything, I think this fact serves as an interesting commentary on how the world of academia and poets within that world, especially, are valued in contemporary society. 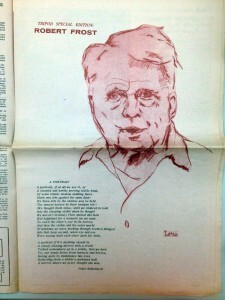 It is a statement in and of itself that the newspaper was entirely dedicated to furthering students’ knowledge of Robert Frost—it says something about the vastly different world of 2013 versus 1962, and begs the question, why aren’t we reading about important figures like Frost in our college newspaper today? While the previous sections of this newspaper focus on letting the reader peek into Frost’s mind, this section serves to let us into moments of Frost’s personal life—a fascinating addition to any newspaper, but especially impressive for a paper being printed at the college level. Although it might appear this way, I think it would be unfair to say that society today does not appreciate poets the way they did in the time of this newspaper. We also have to consider the multitude of ways we have to learn about current events and important people, versus the means that were available in the sixties. So perhaps the question I posed earlier (why aren’t we reading about important figures like Frost in our college newspaper today?) is too great to answer in the immediate. Regardless, this newspaper is a true treasure and a wonderful commentary on a person whose legacy remains pertinent in both the world of academia and the world at large. Getting such a personal look into a canonized poet like Robert Frost was remarkable, and something I can’t really imagine having being given the opportunity to experience anywhere else but the Watkinson. 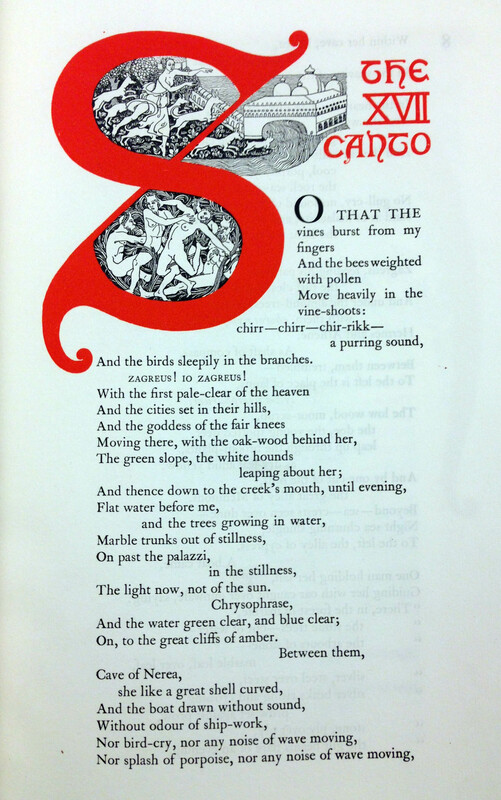 I went to the Watkinson Library early one Friday afternoon to see what I could find of Pound’s Cantos. The first item I picked off the list on the computer screen was of Pound’s Cantos 17-27. My jaw dropped when I saw the large wooden object the librarian brought up the stairs and onto the table in front of me. 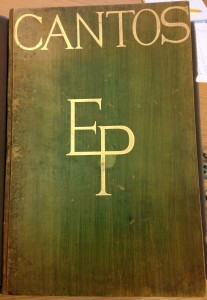 The cover of the book was painted a deep emerald green. It looked about sixteen inches tall, and had the initials “EP” engraved in very large gold letters on the center of the page. The words “CANTOS” were written in a smaller sized font above Pound’s initials. The book was wrapped in three green ribbons, which the librarian carefully unraveled as he opened the extravagant book for me and placed it onto a bookstand so I could get a closer look. As I turned to the first page, written in large black and red letters were the words “A Draft of the Cantos 17-27 of Ezra Pound: Initials by Gladys Hynes,” underneath it was the publication information which informed me that this book was published by John Rodker in London in 1928. This meant that the book was published during Pound’s lifetime, so he likely approved of all the copies of this book. The next page indicated that these Cantos were for a very selective group of people, probably those who had the money to buy such an extraordinary item. It said that this edition of the Cantos contained 101 copies, 94 of which were sold, and the others sent to various Libraries under the Copyright Act. 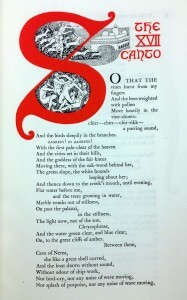 This particular version was copy number four, which was one of fifteen copies printed on special Whatman Paper. All 101 copies of this edition of the Cantos were specifically printed on certain types of papers and marked individually either by roman numerals, letters, or regular numbers. I was even more surprised when I opened to the actual pages of poetry with all the extensive work that went into decorating each page. The first page of each of the Cantos contained exquisite and detailed drawings centered around the first letter of each Canto. Each letter was colored in a bright red, and took up about half of the page that it was on. 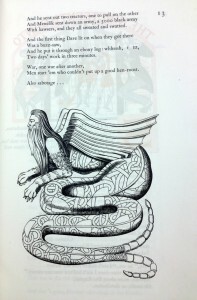 There were images of men, women, unicorns, reptiles, even castles all placed around the first single letter of each poem. 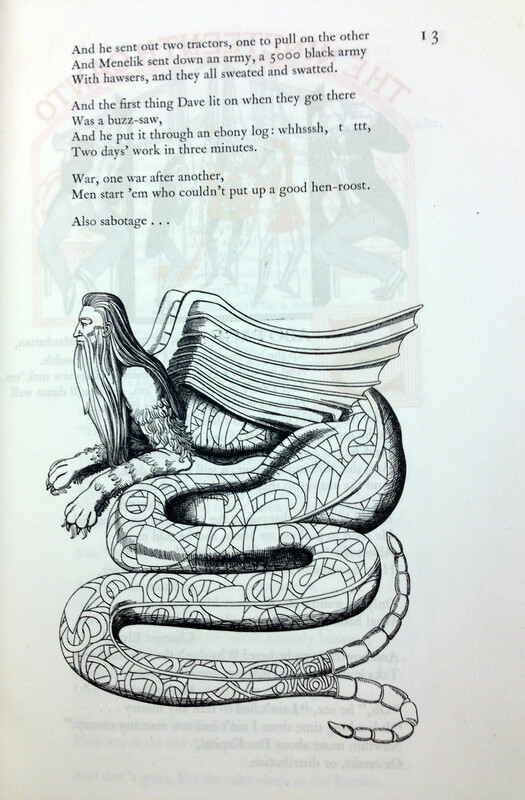 If a poem ended with a significant amount of space beneath it, the illustrator drew large unique figures in black and white – like a man with a snake body and wings. The last Canto, number 27, contained Ezra Pound’s initials and the date September, 1927. Just the size of the book alone suggests that poetry in the days of Ezra Pound was a highly regarded form of art. Poets made enough money to support themselves and their families without having any other jobs, something we don’t see much of today. 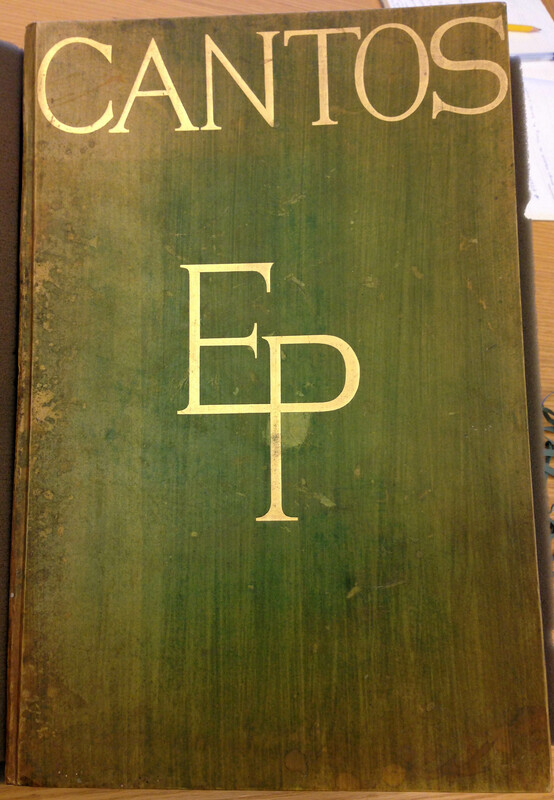 The fact that Pound’s initials were front and centered, and written in gold on the cover of his book, indicate that he was a highly regarded poet, and that people who read his works during that time would immediately know what “E.P.” stood for. Today, I’m not sure who would recognize any poet for just his or her initials. Pound’s initials seemed more important than the Cantos themselves. Because there were only 101 copies of this book made, Pound’s poetry was most likely targeted at a very exclusive audience – probably for friends and those that could afford buying a book with such a high status attached to it. These days, anyone can walk into a bookstore and buy a simple poetry book in paperback for barely any money. But the lavishness of this book indicates that Pound’s poetry was a highly regarded form of art. The amount of detail that went into all of the illustrations and decorative lettering must have taken a very long time for the illustrator. But why doesn’t poetry get this kind of recognition today? Has our generation forgotten that poetry, like paintings or even films, is an incredible form of art? Or perhaps technology is the reason books are no longer presented as rich as Pound’s Cantos were. As the world grows, it seems people would rather stare at a screen than hold an old book, rich in words and carefully published. Looking at this book has made me realize that our generation takes a lot of things for granted. We should be more appreciative of the fine art of poetry, and realize the turn it’s taken over the past few decades. I’ve never seen such an exquisite book of poetry than the Draft of Pound’s Cantos 17-27 that I found in the Watkinson Library, and I am grateful that I was able to see this rare, wonderful item. You are currently browsing the I Found It at the Watkinson! blog archives for November, 2013.